It’s not hyperbole to suggest Pegula is the most powerful woman in sport. As owner, alongside husband Terry, and president of Pegula Sports and Entertainment, the 49-year-old is in rarefied air. Indeed, the holding company manages Buffalo’s NFL and NHL franchises, the Bills and Sabres, with other American sport properties under their umbrella. She became president of both teams last year after the resignation of Russ Brandon, becoming the first to do so in the history of both leagues. And her position within the American sports empire is very much on merit. As the driving force behind the ‘OneBuffalo’ campaign and accompanying mobile app for enhancing the fan experience for both the Bills and Sabres, the South Korean-born businesswoman has been at the forefront of a phenomenal transformation for not just the franchises, but the city as well. Her fingerprints are clear across both teams and having assumed her new role last year, Pegula is becoming an increasingly important and vocal voice in American sport. – In May of last year, Pegula made history by becoming the first female president in both the NFL and the NHL. 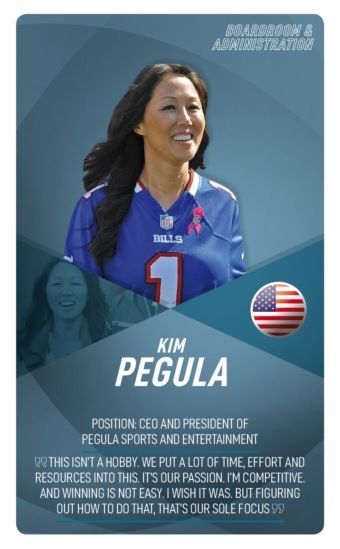 – Pegula’s influence within the NFL continues to grow and last year she expanded her roles after being named to the board of the NFL Foundation in conjunction with serving on the Super Bowl and Special Events committee. – Women’s issues in the NFL is at the forefront of Pegula’s impact as she has appeared on NFL Network and in press releases regarding the subject. Pegula’s story is a remarkable one. As a toddler she was found on a street corner in Seoul in front of a police station and was later adopted by a Canadian-born family who moved to New York. 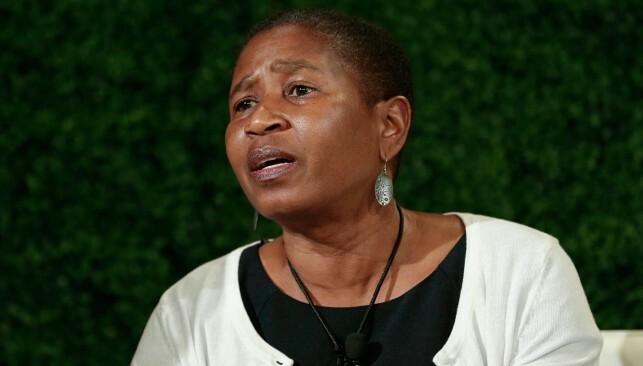 When Michele Roberts was first elected director of the NBA Players Association in 2014, she became not only the first woman to hold that particular role, but the first to head any players union in any of the four major American sports. That role saw her preside over the negotiations for the most recently agreed Collective Bargaining Agreement between the players’ association and the NBA itself, with Roberts helping avoid a repeat of the 2011 lockout after the two sides had failed to agree a new deal before the start of that season. The latest agreement, finalised in 2016, was the pinnacle of Roberts’ achievements in her role, but she’s far from done. She was re-elected director in 2018, and there are still fights to be won – most significantly, a renegotiation over the infamous “one and done” rule that prevents players from entering the NBA straight out of high school. But for a seasoned lawyer once dubbed the “finest trial lawyer in Washington DC”, fights like these are second nature. – In 2014, Roberts was named to ESPNW’s inaugural Impact 25 list. – Roberts brought 25 years of legal experience to her role as NBPA Director. – Roberts was chosen by NBA players from a pool of 300 candidates. 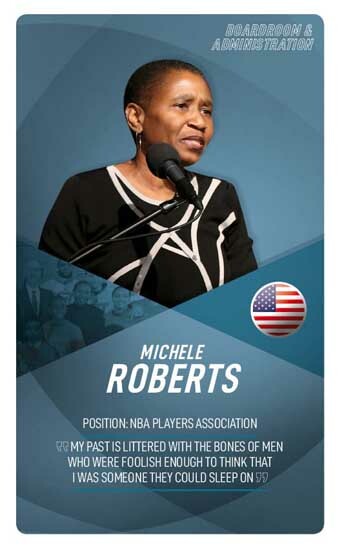 Outside of her role with the NBPA, Roberts is also a professor at Harvard Law School. 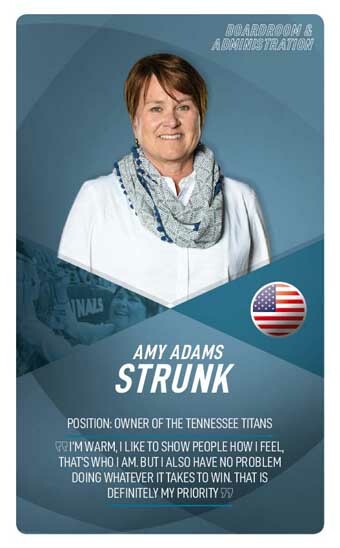 Strunk had no football experience when she took control of her late father Bud Adams’ team – Tennessee Titans – in 2015. But it didn’t take long for her to make her mark, hiring and firing head coaches, selecting staff and leading one of the NFL’s monolithic 32 franchises. 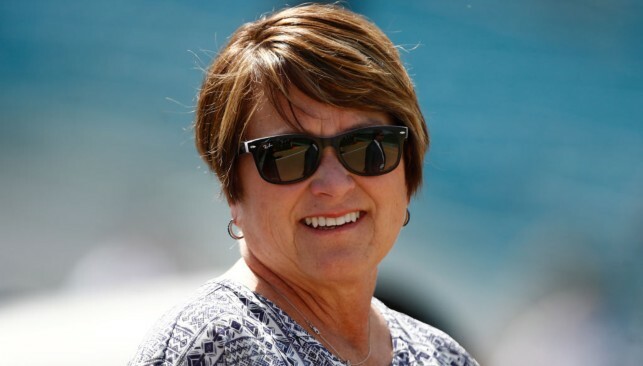 Now one of the most influential people in the Tennessee sports world, Strunk has transformed the franchise thanks to her vision, commitment and leadership in creating a public image for supporters and players. She can be seen strolling the sidelines, shaking supporters’ hands and even features in the franchise’s interview processes for new staff, as well as providing honest opinions about the general direction of the team. A vast contrast to the closed environment that existed in previous years. Although the Titans have only made the playoffs once since 2008 – losing in 2017’s divisional round to the New England Patriots – she promises to do everything in her power to restore the club back to Super Bowl contention. A process that will take time but is firmly achievable under her guidance. – Adams has varied the pricing structure for match tickets ahead of the 2019 NFL season in a bid to encourage more Titans fans to attend home games. – She donated $1 million to the Houston flood relief effort in 2017. – She is on the NFL’s Hall of Fame committee and was also named on the Board of Trustees for the Pro Football Hall of Fame in 2017. Away from her busy role at the Nissan Stadium, Strunk is a hugely successful businesswoman, having founded Kenada Farms and the Little River Oil and Gas Company. Her multi-million dollar ventures have provided her with vast knowledge about customer service and managing a diverse range of employees.